You are here: Home>News>Buy a copy of our CD - Songs For The Farmland Museum! Singing songs are an integral part of our culture – lyrics celebrate all aspects of our lives. People living in Cambridgeshire who worked on the land or in rural industries would have sung songs celebrating the seasons, their lives, the good times and the bad, they’d poke fun at their neighbours and use singing as a means of sharing stories when few could read or write. The CD – Songs For The Farmland Museum – was launched in July 2015 is unique to the Farmland Museum. 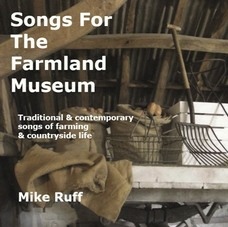 Working with The Farmland Museum, musician and singer Mike Ruff selected songs that can be linked to the museum’s collections and buildings. The CD is available for £10 in the shop and at external events to raise additional funds for the Museum. We gave HRH Princess Anne a copy when she visited on Monday 16 April 2018! The CD is part of our MUSIC AT DENNY project which we started in April 2015 to bring music to Denny. The first part of the project was to raise enough funds to produce the CD of FARMING SONGS – contemporary and traditional in collaboration with Mike Ruff. We are now working on Parts 2 & 3 of the MUSIC AT DENNY project. Part 2 is to use some of the tracks from the CD in the displays within the Pig Sheds, Stone Barn and Village Shop. Part 3 is to create a teaching resource for schools and groups to include some of the songs from the CD, a selection of historic Country Dances and information about the museum’s collection of agricultural machinery and buildings to show how learning about the history of the countryside, country crafts and agricultural life can be fun and lively.